The limestone blocks are cut and modelled in the factory to the requirements necessary for each specific project. Discover the manufacturing process up until final delivery to the client. 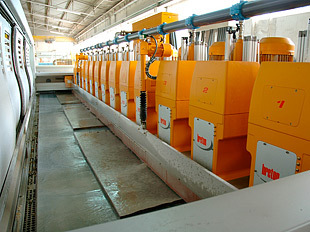 Following extraction, the limestone transformation process begins in the Cutting Machines. The machinery cuts the blocks to the necessary thickness in a procedure that can take between eight and 10 hours and results in various stone slabs. The direction in which the block is cut will define the orientation of the veins and, consequently, the look of the stone. 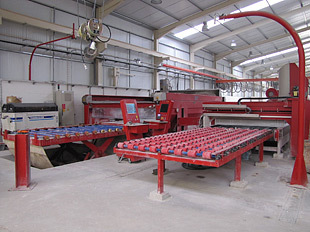 After the desired thickness has been achieved, the slabs are introduced into the Polishing Machine. Using friction, the desired finishes are achieved. The slabs are then digitalized, classified and compared in order to verify that the desired tonnage has been achieved. Next is the cutting process, which is done in the Stone Cut and the Stone Jet — the former making only straight cuts, the latter able to make more complex cuts. 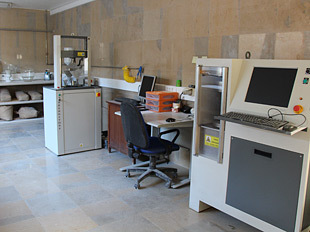 The slab is once again digitalized so that the operator can identify any defects in the stone. 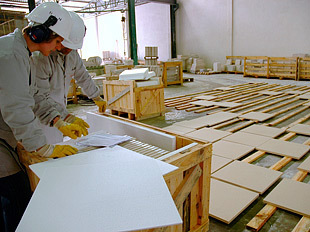 Using the information regarding the project seen on a monitor, the operator positions the pieces avoiding any identified imperfections. This procedure guarantees that all the cut pieces have the desired quality. When the products are thicker — steps, planters, kerbs, cubes, Portuguese pavement, amongst others — the Stone Cut Mille is used. This equipment is capable of various functions. It digitalizes and classifies the slab, does the finishing (only in perfect areas of the stone), as well as cutting and modelling the piece. 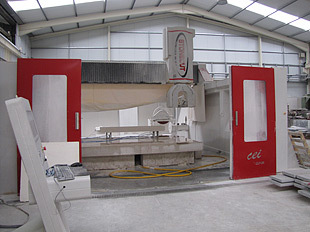 The modelling of the pieces into more complex formats is done using the CNC (Computer Numerical Control). 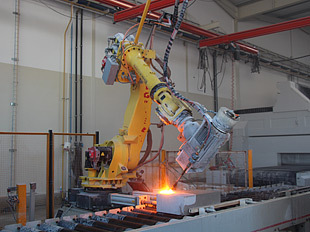 SOLANCIS is equipped with CNCs with three and five axis which models the pieces in various ways. Cornices, sills or 3D Facades are products tailored using this equipment. Following labelling and detailed inspections, and if not requiring any further finishing, the pieces are packed and protected in accordance with the placement plan, in order to transport them to their destination. The packaging is made to measure for each piece by our own carpenters.